Delighted to be producing New Music Dublin Defrosted in September 2018. I take on the role as Olga Barry has since become Director of the Kilkenny Arts Festival. New Music Dublin is Ireland's premiere contemporary classical music festival, and will feature performances by the National Symphony Orchestra, the Irish Chamber Orchestra, the National Chamber Choir and more. It runs from 21-23 September 2018. Islander presents ‘Quiet Lights’, an exciting new small-scale festival with a big heart, which aims to shine a light on the new wave of Irish folk and traditional talent that are quietly forging new paths, recollecting old tales and making new stories. From Friday 7th to Sunday 9th September, music from the heart and for the soul will fill the city's nooks, crannies, chapels, and bars. The line-up features established and up-and-coming names like Katie Kim and Radie Peat, Lisa O’Neill, Ye Vagabonds, Caoimhín O’Raghallaigh, Slow Moving Clouds, Landless, Inni-K, Cormac Begley, Saint Caoilian, Dowry, Claudia Schwab, Elaine Malone, and more to be announced. The sound of toes tapping and string plucking will be found across various intimate Cork venues including: Coughlan’s Live, Sirius Arts Centre, The Roundy, St. Peter’s and The Chapel at Griffith College. "I’m really excited to announce the first details of the inaugural Quiet Lights weekend in my home town of Cork. It's going to be a beautiful blend of folk and traditional music in the music spaces of the city and beyond into the harbour. We’re utilising well known music venues, but also some rather unique new spaces, which will add to the distinct and unique flavour of Quiet Lights." said Jonathan Pearson of Islander. Ye Vagabonds are up for Best Traditional Track at the 2018 BBC Folk Awards for their track 'Lowlands of Holland'. The awards ceremony will be on April 4th in Belfast. This is How we Fly have scored the music for the new Polish language film 'WIKI', directed by acclaimed director Veronica Andersson. April 2018 sees the release of Seán Mac Erlaine’s third album Music For Empty Ears on the Ergodos label. Following the critical acclaim of his first two solo records Seán is working with two of the leading lights in contemporary music, broadening his soundworld and embracing a collaborative approach. Norwegian musicians Eivind Aarset on guitars and effects, and live sampling pioneer Jan Bang bring an expansive, detailed palette to this work recorded in Oslo. 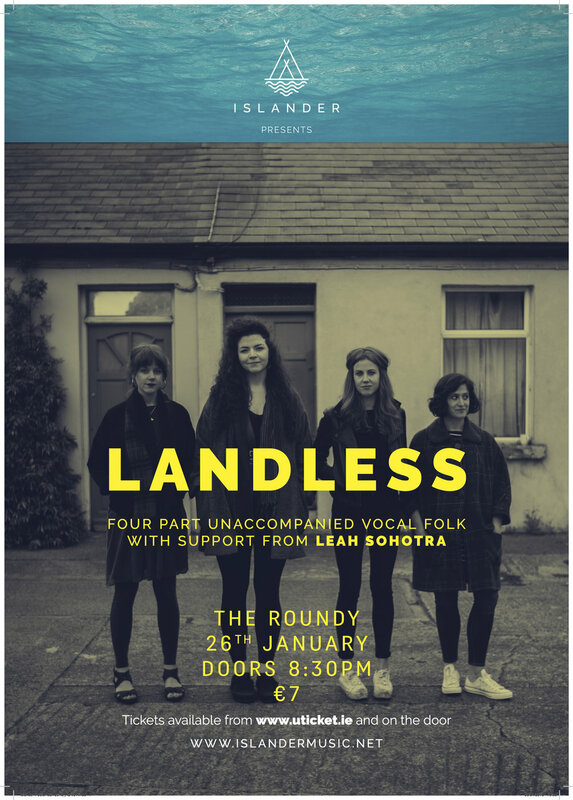 The first Islander show is a small intimate show in Cork city featuring one of the country's most exciting trad/folk groups Landless, with support from local singer-songwriter Leah Sohotra. Landless are Ruth Clinton, Meabh Meir, Sinead Lynch and Lily Power. They sing unaccompanied traditional songs from Irish, Scottish, English and American traditions in close four part harmony. Their repertoire features songs of love, death and lamentation, as well as work songs, shape-note hymns and more recently penned folk songs. Landless have performed in a variety of settings, both in Ireland and abroad, and are closely involved with traditional singing sessions in Dublin and Belfast. They perform their first Cork headline show in The Roundy, the new home of the iconic Plugd Records, and support from the night will be the old-time Americana stylings of Leah Sohotra, who has started to make her name off the back of a few support slots with Cork favourite Mick Flannery. Ye Vagabonds have released their debut album on their own Inglenook Records. You can hear it worldwide on any of the major streaming platforms, and the album is available in CD and digital format from their bandcamp. Ye Vagabonds have teamed up with the wondrous Myles O'Reilly once again to create the beautiful video for second single Half Blind. Ye Vagabonds, Myles O Reilly and Conor Campbell came together to create the beautiful video to Song Long Forgotten. The next single is out this Friday and the album will be out the following Friday. This is How we Fly yesterday launched the lead single from their new record. It's called Rí Rua and it is an absolute beaut. Filmed on a wintery night in Fumbally Stables by the inimitable Myles O'Reilly, it's a gorgeous piece of work and I'm delighted that it's out in the world. They launch the album 'Foreign Fields' on 15th September, with shows in Dublin on the 14th (7pm & 9:30pm) and in Cork as part of Sounds from a Safe Harbour on the 15th.